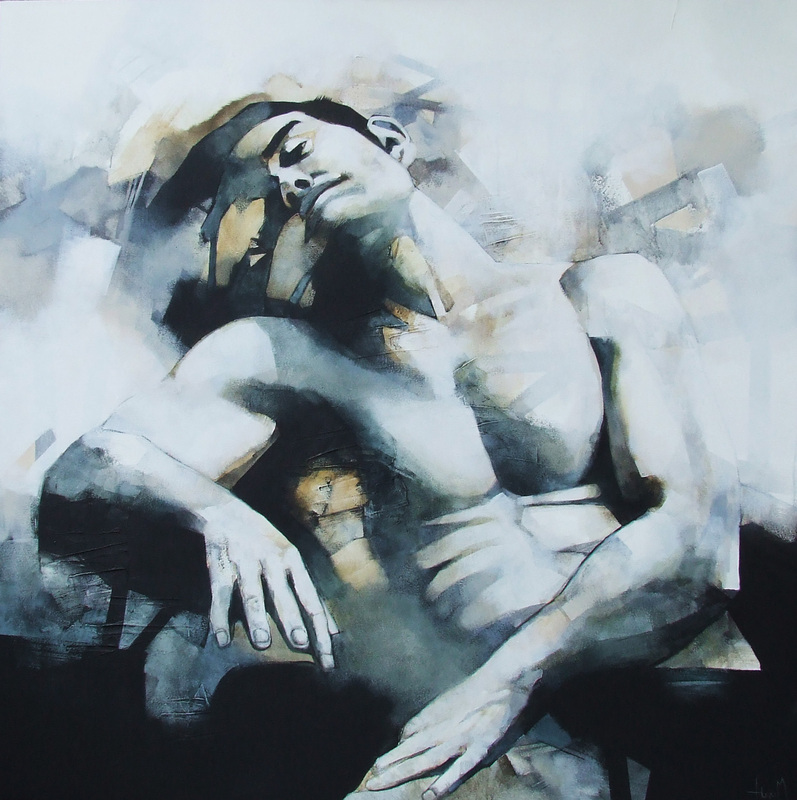 In my paintings I focus on figures to explore all the vicissitudes of the human condition. This has always been the focus of my interests both in my art and my life. I have always held with the belief that an unexamined life isn’t worth living. But to explore your own psyche also means to explore the lives of others. I find it to be an obvious truth that we have more in common than whatever individual differences we might have. So I believe that coming to an understanding of yourself is also to understand the people around you. ‘Know thy self’ as the Greek proverb goes. So my paintings draw from this understanding. Every figure is intended to be ‘everyman’ (oreverywoman). This is why a simple figurative work can be so emotive to people, and different things depending on the observer. In my work the figure stands alone, inactive. The focus is on the internal world of feelings and thoughts. I draw my inspiration from observing people in their day to day lives. Sometimes it’s the line of figure that will attract me, sometimes it’s the emotion. Often it’s an intuitive response to what I see. I guess we’re all filters. The entire universe goes into our senses, through our minds and comes out different. As an artist I get to visually represent what my filter exudes. This is what you see when you look at my work, the world through my eyes. You have begun to include the silhouettes of animals with your figures. What does this represent to you? I have begun to include not just animals but all kinds of things in combination to my figures. I only do this when I find the figure alone somewhat lacking. It is the benefit of combining two concepts instead of one. The associations that it conjures in the mind of the observer are far more precise. Simply put it creates an easier meaning. This is helpful when I want to communicate more directly; other times when I like to be more vague I will let the body language of the figure stand alone to be interpreted. Is there a way that you would like your work to be interpreted? This is an interesting point to me. People always seem to think that there is a correct interpretation to a work of art. That somehow you are unable to appreciate a piece until this is revealed. This has the effect of people telling you furtively at exhibitions ‘I don’t know a lot about art but I know what I like’. I guess this aura of mystery is helpful in the selling of mediocre or purposefully obscure art. I do not believe an artist should hide behind meaning. A painting that has to be explained before it can be appreciated is a flawed work in my opinion. If the painting is trying to communicate something (and it doesn’t necessarily have to) then it should be able to do so on its own. Of course it can be fun or interesting to learn more about the artist’s intent or history and how it relates to his work but it shouldn’t be a requirement. So to answer the question I would like everyone to try and first figure out what the painting means to them, to explore what reactions it produces in them even if those reactions are negative. This has the added benefit of making you look closer. I would like my audience to really look. To wonder why I did this or why that spot is there etc. long before they even look at the title. This is a question that always leaves me a little stumped seeing as though I have spent an inordinate amount of time developing my style I have spent very little time wondering what to call it. Some have said cubist but I think that is because of my love for hard straight lines which in itself does not make a work cubist. The question is further complicated by the fact that my style isn’t entirely consistent (though always in a single painting). I guess I find labeling it kind of redundant. Call it neo-expressionism. That could probably mean almost anything. I have learned to paint in many different ways in my time as a professional artist and what I use is determined by what I’m trying to achieve. Can you tell us a bit more about the development of your style then? I walked a very long road to get to where I am in terms of style. I am self taught and from the beginning I experimented a lot with different styles and this will probably continue as I go on. Technical mastery is very important to me. I think all accomplished artists would agree with this. Making art is not easy nor do I believe it should be. Finding effective composition in a work can be enormously difficult. After many years of practice you may come to a place where you can finally forget about technique, where the painting can be allowed to just happen. An effortless effort if you will. This is what I strive for but it isn’t easy to achieve. Many renowned artists attempt to circumvent this obstacle by basically repeating the same composition over and over in all their work. They learn one trick that works and stick to it. It is very tempting but ultimately unfulfilling. I really want to see what quality of painter I can become in my lifetime even if it means never being satisfied. This feeling of never being satisfied drives you to try harder. It means painting and repainting some works many times. That is ok. When you finally have a little breakthrough it is one of the best feelings in the world. I have been part of Rossouw Modern since 1996 and Jozua has been the most constant critic of my work since I was 23. We’ve had 14 solo shows together, always as a collection of my latest works, but with this exhibition – Underneath the Surface – I’ve had the time frame to consciously explore the hidden worlds of my subjects, as stated before. I tried to make the images even more emotive. I love trying to capture the hidden themes that we discover as we live. States of existence that are sometimes dark, sometimes tragic or perhaps just commonplace. I also tried to make my use of colour more evocative than ever before. I am please with the results and eager to hear what people think about the new work.